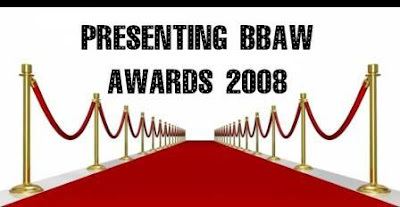 So how is the BBAW Awards Show so far? Having fun? I have the honour of presenting the award for Most Concise Blog. The following bloggers have the ability to say a lot with just a few words. They'll never be accused of being long winded. They're great when your looking for a review with "just the facts, ma'am" instead of just rambling on and on and on...you know, like I do! No one will be playing the music over these folks' acceptance speeches. Edited by Rod Lott "Reading material to get excited about. That includes all kinds of genre fiction, from horror and sci-fi to mystery and suspense. It also includes graphic novels, trashy paperbacks, cheap magazines and other things that much of America pretends to be ashamed of, for no good reason. At BOOKGASM, we celebrate these escapist efforts, through daily news, reviews, interviews and other things that don’t end in “-ews.” Think of it as a community; we encourage your posts via the comments section under each item." Shara Shansaucie is the author of this LiveJournal. "Reading has, for the most part, always been a major part of my life. And I read so much that I’ve long passed the point where I can easily remember what I read and what I thought about it. So this journal, in part, is a way for me to keep track of what I’m reading, how much, when, and my reactions. It allows me to go back and remember what I thought of a particular writer’s work, or a particular book, and that sort of thing. Don’t blame me, but I’m a nerd for stats." And the unusual name... "To anyone familiar with calico cats, you know that those beautiful little creatures can be sweet as honey one minute and mean as fire the next. They're temperamental little creatures, and you never know quite what to expect from them. This is a good thing to keep in mind when reading this journal." Gwen Dawson is from Houston, Texas. "Short, thoughtful reviews with real opinions, leaving you more time to read the books." Now that's concise! "We're two amusing chicks with more books and opinions than we know what to do with. Love to read and discuss the things you read about? Drop in and join us! Comments, questions, and friendly debates are always more than welcome. We'll read pretty much anything that falls into genre fiction: fantasy, science fiction, romance, horror, and even the occasional mystery/thriller." This is a LiveJournal community hosted by Ocelott and Sarlias. "Over 2 years ago I began my blog. I named it "Thoughts of Joy...", because I truly just wanted to keep a record of my thoughts on the books I read - nothing profound, nothing literary, just my thoughts. After meeting such fabulous book bloggers, discovering so many new books, and participating in numerous challenges, my reading has been at its best! My horizons have been broadened well beyond what I could have ever imagined and my enjoyment has blossomed due to the blogging community. It's so much fun to share a passion with others - it makes it all the sweeter." Although they are all winners in my book, there can only be one 'official' winner. Congrats to Bookgasm! 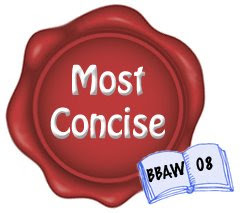 Your the first ever winner of BBAW Most Concise Blogger Award!